The Ion Xpress Kit cuts the wall clock time by about a factor of two, to around 5 hours. Hands-on time is on the order of 90 minutes. A video on the product is available if you join Life Tech's Ion Community (registration required), which includes both an overview of the protocol and two customers' endorsement of the new protocol. This tuning of the protocol had been sketched in my previous conversation with Ion; much of the improvement involves cutting down the number of PCR cycles. 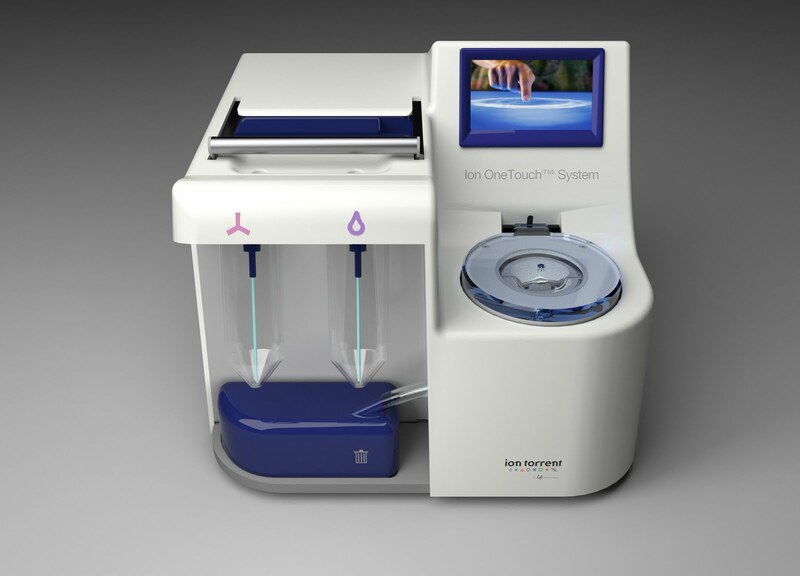 The Ion OneTouch System, illustrated above, is an integrated instrument for template prep which is promised for third quarter (with some early access earlier in the year). Occupying about one square foot of bench space, it clearly fits in with an Ion Torrent PGM visually, though adding two new ionoglyphs. As far as my predictive capabilities go, I'll claim a small success but certainly not a complete one. Rather than some sort of fancy microfluidics, as I had guessed, a simple filter-type mechanism generates the emulsion in a continuous fashion. The part I guessed right is a continuous PCR system. After completing amplification, the emulsion is gated to the integrated microcentrifuge. So, in three hours of wall clock time and very small amounts of hands-on time (loading samples and unloading prepared template), this system will automate nearly the entire process. Remarkably, the pricing is targeted at $5K, which Ion presents as a 10% add-on for the basic PGM. The OneTouch continues Ion's preference for decoupling template prep from the sequencer, as opposed to the integrated system announced for Illumina's MiSeq. With a three hour run time, the OneTouch roughly matches the throughput of a PGM, suggesting that many labs will have them paired 1:1. However, a lab running very short sequencing runs might well increase the ratio, and conversely one aiming for very long reads (and therefore runs) might match them differently. Separate units does give flexibility in placing them in the lab or matching the throughput of template prep and sequencing. A separate unit also could be useful depending on the cleaning or maintenance needs; a spare $5K OneTouch would not be onerous but would be a way to ensure a production lab stays at peak capacity. The one glaring question I failed to ask in my interview is the issue of template carry-over. My understanding is that most of the system is reused for each run, so there must be a flush cycle. So, for anyone who buys one it would certainly make sense to do some testing in this area. An obvious test would be to run a test library (E.coli or something else simple) and then something completely different; any E.coli showing up in the second run could be used to assess carry-over. [11:12am Update: Ion has informed me that the amplification plate is disposable. A video of the system is also now available]. Each of these announcements brings the theoretical speed of a PGM to quite a short clip, which will be valuable for the clinical and related markets they would love to occupy. For a fusion amplicon sequencing, it is possible to imagine PCR (using one of the modified polymerases that is tolerant of environmental contaminants) over about 2 hours, followed by a quick quantitation of the results and perhaps purification for another hour (using one of the available automated electrophoresis fractionation systems), five hours of template prep with the Xpress kit, two hours of instrument time and another one hour of data processing and analysis. Total elapsed time in this scenario is 11 hours; clearly not a single-shift operation but if actionable results are time-sensitive not an unreasonable time. With the OneTouch, another two hours could be shaved off that, which is still a long day for one person but quite reasonable for multiple shifts. Now, this is clearly just a bioinformatician waving his hands; ideally there would be a regular (quarterly!) sequencing Grand Prix to really put claims of such speed to the test. Another Ion improvement will be showing up in the very near future. A simultaneous set of kit and software changes are coming which are touted as delivering improved performance. Unfortunately, they will also create a divide; libraries prepared before the change will be incompatible with the new reagents. The PGM system is hurtling forward. Ion's staff has emphasized to me that they are focusing on one area at a time, with read length and quality being the next priority area. I've seen some data (from a third party, but alas I promised to not publish details) and the current quality is certainly rough, but just as certainly usable for select applications. With luck, I should have a dataset early next month which I can be less circumspect about (though, alas, not completely open about). What is that screen in the upper right? Did they embed an iPad into it? Watch out on your grant for people buying 5K iPads and popping them out to add ear buds. Ionoglyphs? Who makes this stuff up? I've seen some data from the Ion Torrent also (soon to be published). Quality and read length are certainly the most important area for them to improve, as the method (as of a month or two ago) was only getting about 67-long reads if you trimmed enough to get 1% error rates. The error rates shot up enormously towards the end of 100-long reads. I think that they can fix this in the next 6 months or so, and they are going to have to in order to stay competitive. Thanks for the post. Very happy to hear about this improvement, and I hope they continue to push the processes. Watching the video, you get the sense that the sample is ready to throw on the PGM when it comes off of the OneTouch. You still have go through enrichment and then ascertain the success of the emPCR for loading through fluorimetry or titration. Don't forget about library prep. Any non-amplicon library (DNA, mRNA, ChIP, targeted capture) will still need to go through a laborious process, just like any other platform. This instrument is good for steps 12-14, but they gloss over the real work needed for sample prep. Does it still do emulsion PCR or not? The GenomeWeb post claims they move away from emulsion PCR. Martin: I was as puzzled by the GW declaration as you are. You definitely still form & break emulsions. My understanding is that the "amplification plate" is a continuous flow PCR. But I'm now feeling fuzzy as to whether that is really the case or perhaps it is an isothermal amplifications scheme (I remember asking whether you needed a separate thermocycler & being reminded it is an integrated unit, but that's still ambiguous whether there is an integrated thermocycler. Paul: I'm guilty of attempting to coin the term "ionoglyphs". Is that Mr. Monopoly symbolizing old & slow sequencing? "In late June the company will start shipping a $5,000 automated sample-prep device for the PGM, called the Ion OneTouch System, that will use an improved version of emulsion PCR, though it will still rely on bead-based clonal amplification. That system will be broadly available in the third quarter." Hmm. The price I'm seeing on ABI's website for the Ion OneTouch System is $14,490.00. Which is a lot more than $5k. The One touch is indeed emulsion PCR, with the emulsion being formed by sample and oil mixing before being pulled through a filter. It then goes through a plate that is plumbed to and away from a heating element. I would like to see a solid phase capture and amplification alternative. Another Low Cost Sequencer on the Horizon? Can we treat the kinase du jour?